Put down the iron! Use the Pants Stretcher to get perfectly creased pants and keep the wrinkles out. After washing pants, just insert into each leg along crease (if you prefer no crease, insert along the seam). Our Pants Stretcher - Two Pairs is OUT OF STOCK, but we have ordered more! You are still able to purchase it now and we will ship it to you as soon as it arrives. Questions? Please call 1-800-438-5346 or email us at info@Lehmans.com. Insert pants stretcher, through the waist, into each leg of freshly washed pants. Wide end adjusts from 20-1/2" to 12-1/2"
Narrow end adjusts from 11-3/4" to 7-3/4"
Outstanding price , work great and are very well made. Wow, just wow are these good! I am a salesman and a neat, professional appearance is paramount. I originally bought them for my jeans as to rectify the knotted mess ( my jeans) that comes out of a high efficiency washer. HE washers spin at great speeds to reduce dry time, but also result in wrinkly jeans. This is the cure! I also tried them on khakis, and found out they certainly work well for them too! How many things have been forgotten about , when they were the best all along? Thank You Lehman's for an isle of sanity in an insane world. I purchased a pair and have enjoyed iron free creased jeans! I ordered more at my local retailer....what a mistake...they collapsed so they also had a lump mid leg! I am now purchasing 2 more pairs of these great pant inserts! I remember these were used when I was young. Great energy saver and pants look pressed. It is so nice to get products that are made to last! These are the same pants stretchers used for generations and they are built as well as those from years ago! Wonderful product, keep up the great work! These are the same great stretchers my Mother used when I was a kid, and they work great on my jeans. I even use them on the ones I keep starched. I wish I had paid attention to how wide these are. I don't wear skinny pants, but these only fit into one of my pairs of (women's ) pants. That pair is linen and stretched too much when I used these -- got a saggy look. So I won't be using them anymore on that pair. Also, they arrived bent in the mail. I was able to straighten them out enough that they worked fine. Works great for pants that can only be cool ironed. so happy I finally purchased these! My husbands work slacks look like they've just been picked up from the dry cleaners, and all our jeans look fresh and have a beautiful crisp crease.\, without the ironing!! Love them! No more tedious work of ironing pants! Great for dress slacks or jeans. Love 'em! The item works exactly as advertised. This is an item that my grandmother used back in the 1940's to avoid ironing the heavy work pants used in those days. These stretchers work very well on men's or women's pants regardless of the the fabric or shape. The only restriction would probably be on the skinny leg jeans and pants. I have been looking for these ever since my Mother had some went I was a teenager. I thought had quit making them. These are just great. highly recommend. 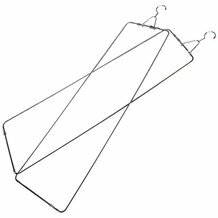 When I was younger (I'm 64) I used these stretchers for all my brother's jeans and we had even children's sized stretchers too. We did not have to iron. When I married and looked for them they were not available but I found them here and I use them all the time. It's such a pleasure to pull them out of the jeans and fold them up pressed crisply and ready to go. For those who don't have a clothes line, I hung plant hanging hooks over the rafters and inserted a shower rod pole and hang them there. You don't have to have a clothes line. I have used these forever & love them!!!! Just bought a new set!! Saves me from having to iron as much!!!! We were so pleased to find where we could buy some of these. I ordered 3 pair. They are of better quality than the ones we have which are very old. 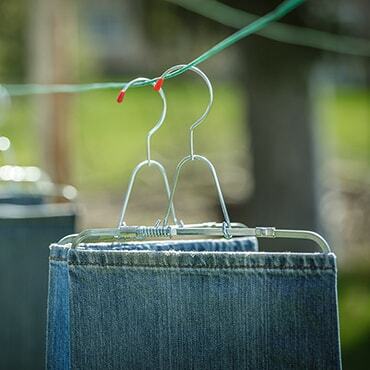 I am thrilled with having the hangers for them which works great on our outdoor close line. They are a little bigger than our old ones and are a tight fit for my husbands jeans. My Mom used these on my Dad's pants when I was a child. I tried them out on my pants over the weekend. Perfect crease in my pants that has not come out yet with wearing. My pants also dried so much faster since I don't use a dryer. These are a very high quality product. I purchased 2 pair. 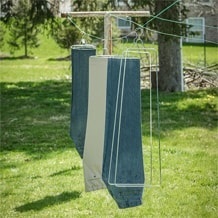 Found this product and it took me back decades when Mom would use these stretchers after washing our jeans. Always had a straight crease and wrinkle free. I am older now but still wear jeans on the ranch - now with sharp creases just like when I was a kid. This product works great: Just like it did 50 years ago. Thanks for bringing it back. These pant stretchers save me a lot of time compared to ironing. The crease is not quite as sharp, but good enough for most pants. For the few I want a better crease on, it's a very quick ironing job if the pants have been dried using the stretchers first. The only thing I'm missing is a smaller size for skinny pants. These pant stretchers arrived in very good time, were packaged very well and included a hanger hooks that I did not expect but am very glad to have! They are very much like the ones my Mom used years ago. I am so glad to have found them as they will save lots of time ironing (and that's something I hate a lot having to do). I notice also that the width adjustment clasps are actually improved over the ones I remember from the '60s and will probably last a lot longer. I have not seen these since mom used them very glad I found them on your site. They are well made, work great, and shipping was very fast. Thanks. It says 37 long, and they are, but don't forget that that's the full size. That means that if you're short like me and wear 30 inch length (as measured from the inseam) pants, using these will NOT reach all the way to the waist, meaning the waist at your belt line is likely to shrink. Now, I suppose there is a limit to how long they can make these, but if the width is adjustable, the height ought to be as well. Be warned. You bought them to save money on drycleaning but if you have to toss the pants because they no longer fit at the waist, there's little point. When I was a kid my mother used a pants leg stretcher for my Dad's work pants. I don't remember the hook, but it is about the same. I am very pleased with the 3 I received. My dryer died and I decided not to replace it. These are great for jeans. It is too bad these are not made in the USA. It would be nice if there was a size to fit men's 33x34 size jeans and women's size 4. I have old stretchers that are sized OK. An option for a children's size and medium size would be a nice addition. Seeing and trying is believing! I watched the video of how to put stretchers into each pant leg- this is important- make sure you watch it. My first try was with a just out of the washer pair of my husbands dress chinos. They had lost there nice crease and were pretty rumpled looking. When I hung them up to dry outside in the hot Colorado sun I was not confident that the niceness could be restored to them as they appeared kind of wrinkled on the stretchers. However, when the pants dried I was totally amazed at how great they looked. A great product! Wish these were American made. They are more flimsy than the ones we used to use. I purchased 3 pairs. One broke right away but still using the other two. Love these. Thinking about ordering more! Really reduces ironing. Great quality. Worked very well. Very pleased. A very functional design that has been resurrected from the 1950's. An excellent idea then and an excellent idea now. These are wonderful. Just ordered 3 more. These were popular in the 50's about the time that my Mom thought I should be responsible for my own clothes. I really dislike ironing and these provided a way around that onerous task. I'm so happy to find these again. Goodbye, iron! How can anybody rate this other than FANTASTIC! No more ironing, no more shiny spots from the iron, savings on electric, pants!!! I bought 4 & use them every wash day. My Mom used them when I was a kid (I'll be 65 soon)& can't believe I waited this long to find out if they still made them! THANK YOU THANK YOU. These pant stretchers are wonderful, just like I remembered them to be years ago.Product is great and I was quite satisfied with your service. This is a fantastic product. Easy to use and saves on ironing. I will be purchasing another one soon. I love these stretchers! Should have ordered more, and will. Everyone raved about what they do for jeans, but I have used them on linen and silk pants, and they look better than when they were sent to the cleaners, and definitely better than when I iron them. Recommended them to all my FB friends. The site does not specify that this item is a LARGE pant stretcher, nor does it give the width measurement (only the length). They do not carry small or medium, so I would not recommend risking the loss of the postage unless you are a large person. Quality constructed! Easy to minimize the width, insert into pant legs and expand width. Hang to dry. These are great! My Dad's slacks or cargo pants will not need to be ironed when hung out to dry. What a blessing! A time saver. Thanks so much! Our Grandmothers used pant stretchers when we were kids. My husband suggested using them to press our pants to save money and time when I cannot iron them. I am nurse and work two jobs. Thank the Lord for the pant stretchers. Years ago (10) bought three pairs classic pants stretchers from a home catalog and used them a lot, especially for my Jeans so they would not shrink and looked creased and ironed when dry. As life would have it I am down to only one which still works.. knock on wood. I am so please to have found what has taken me years to find at Lehman's! Mine did not even have the built-in hanger. I grew up with these and cut my laundry baby teeth with a wringer washer. Looked all over for them and was so glad to be able to purchase at Lehman's. No problem with the springs or tension mechanism. All round must have's for laundry day! Pants stretchers were great, we have been looking for this item for years. Thank you for carrying something that we had years ago, but lost them when we moved. Used these for many years and never had to iron pants or jeans. I haven't seen them in nearly 50 years. I was in a store the other day and a lady was looking for some. Too bad I didn't know you had them then. My father was looking for this product. He had no luck. I didn't even know what this item was until I found it at Lehman's. It is exactly what he was looking for and is very happy with the purchase. My wife just loves this product, she can have perfect seams from steam iron. Shipped on-time, price right, no damage. My husband buys cheap jeans from Walmart for his work since they are always getting grease and dirt on them. No matter how I washed and dried them. they would always look like he slept in them! With these pant stretchers I can get the rumples out and put creases in without having to iron or use a dryer! Love them! My husband has been requesting these pants stretchers for a couple of years. I have searched in MANY retail stores (dept., hardware, etc.) a friend suggested I search online. Your company popped up. Thank you thank you. I ordered him 3 sets. He absolutely loves them. He has to show me the beautiful results each time he hangs up a pair of jeans. His favorite Christmas present by far! I received my order 3 days ago and immediately tried them out. Excellent results, they are well constructed and are easy to use. With their use no ironing needed. Today I am ordering 3 more pair. 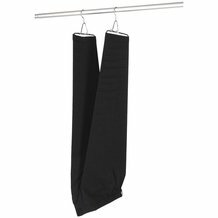 These pants stretchers work beautifully to dry and shape corduroy pants and jeans. They are well made and are very easy to use.I am so glad to have found your website. Stretchers are better quality than the old ones that I have had for many years. Order was received in timely manner. 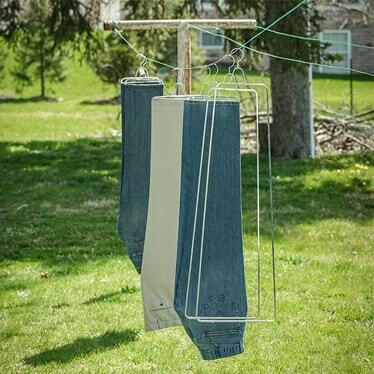 GREAT for air drying my jeans so they don't shrink and they look great! Glad to find them. What a great idea! They work great. You pull them to make them as wide as you need, so they fit any sized pant/jeans I have thrown at them. What a brilliant product! What mom used. They are a great find. We got the stretchers to deal with cargo pants. The many baggy pockets made it very difficult to iron. The stretcher solves the problem, giving great even creases. Only the tops need touching up with these all cotton pants. We use them on jeans as well, probably cutting down dryer time in the process. A bit awkward to use but that struggle is worth it to save the ironing struggle. These are great, like the ones my Mom had when I was a kid. I love them! I will order more for the rest of the family. I concur that the stretcher is great for jeans. They are a greater blessing for cotton cargo pants, especially for aligning the crease. Being an RVer, I was so glad to find out these were still available. They work great and so much easier than trying to iron pants while living in an RV. I highly recommend them. I didn't know they made the stretchers until I found the Lehman site. They arrived in a timely manner. They are sturdier than what I figured they would be. Excellent product. A time saver. These actually do a better job than drying and ironing. These put less wear on the fabric, and you don't have the pocket and seam lines that can happen when you iron. My reason for not giving five stars is that they are too large for women's size 4 or less. Even on size 6 they leave a bulge in the seat and stretch out the narrower sections on the leg. Plus, they don't handle narrower legs with boot cut bottoms. But they work great for my husband's traditional cut pants -- especially for winter cords!! These pant stretchers are the bomb! They could'nt work better. Lots of comments on my perfectly creased 501 shrink to fit levis. Looks awesome with my suntan full quill ostrich boots! I remembered these when I was a kid. I was having trouble ironing some of the slacks we had and the dry cleaner charged so much that I decided to look for some on the internet. It has made ironing slacks so much easier. They are quick and easy to adjust and put in a sharp crease. If you need further pressing, half the work is done for you. Used these as a kid, didnt know they stil made them, thank you for offering them in your catalog. Love the hangers, much easier to hang up. These pants hangers are better quality than I expected. Don't hesitate to purchase them as they are very easy to use and excellent material quality. These are great for jeans!! They are sturdy and hold up to the toughest denim. Thank you for a wonderful, hard to find item. I ordered and received my items in a short amount of time. I love the pant stretchers......they save ironing and even dress slacks come out perfect! Thank you for the catalog and great service. These stretchers are sturdy and much better than the ones I already own. Thank you for a great product. Love them. My jeans look nice and they are not shrinking in the dryer. They are just like the ones my mother used when I was growing up. Nice item. Have not used these since I was a boy and they work fantastic. Saves ironing time! Get you some!!! After I had complained (once too often) about my jeans not being well pressed I was informed that if I thought I could do better to just 'have at it'. So, I found these great pant stretchers and life is good again. Thanks for a well made, easily operated product. 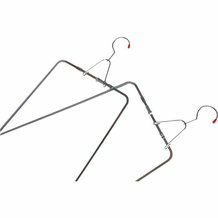 Just ordered the pants stretchers last week and have used them twice already with great results. I love the way they easily adjust to the size and cut of trousers with just the touch of a lever.I hang my laundry on lines and don't have to worry now about pressing a crease into the trouser legs, or ironing out wrinkles. They work just as well on good dress slacks as jeans. I'm very satisfied with this product. I've been using pant stretchers for forty years, but my old ones finally broke beyond repair. I was delighted to find replacements at Lehman's. They are much heavier gauge steel with nice secure closures and spring-loaded releases. They are far nicer than what I had and should last another fifty years. Thanks Lehman's. I love these forms! They save me so much time when ironing day comes around. They are easy to use. I'm so glad I have them and have recently bought more. I wear rigid jeans and let me say these things work great! I can wear my jeans and look sharp at the same time. These are great! I remember my grandmother using them, too. They work well on women's pants. These make my slacks come out smoother than ironing without all the work, they are wonderful. I am truly pleased with the quality and ease of use. Received my pant stretcher and it was what I expected. I had some years ago and was surprised that they were still available. Wish I had ordered two. Clamps slipped easily until I roughed up slides with sandpaper. Creases not crisp and starch needed to hold good crease. They are geared to larger sizes and barely go in 33X34 regular fit jeans. They work well for me now after I learned these things. These work every bit as well as the ones my Mom used to make me use 50 years ago!Very fast shipping, as well.Thank you! These are AWESOME!! My husband works in the oilfield and has lots of pants these pant stretchers make my life so much easier because I don't have to iron as much! I highly recommend these. I was overjoyed to find these at Lehmans and have no complaints. However, I could use some instruction to get better at using them. Thank you Lehman's for this great product. I have been looking for this quality of pant stretcher for years. They are the closest thing I have found to the ones my grandmother used over 50 years ago. The single piece frame design makes for a perfect crease every time! The hangars are a nice bonus. Thanks again! These are absolutely indispensable for this very busy farmer's wife. My grandmother used them (70 years ago) and they are as well-built now as they were then- The creases are very sharp and the pants do not NEED to be ironed !!! I've been looking for these and decided to give this brand a try. Excellent ... I love creased lightly starched jeans and this makes the look a snap without the expense of taking my jeans to the cleaners. Your Jeans will last longer also without putting them in the dryer. Just what I was looking for-at the right price. Exactly as I remember as a child. They are great for jeans and chinos that you don't want to put in the dryer. WONDERFUL! I had wrinkles in some jeans that I could not iron out. These stretchers made them disappear. I love these. I have been looking for them for a couple of years. So glad I found Lehman's. They were shipped in packaging that was very sturdy; they arrived in perfect condition. Kudos to the shipping and packing folks. I haven't seen these since the 1950's. They worked great on my jeans! I recently lost my wife and don't like ironing. Remembered these stretcher when I was a kid. If you don't like ironing or don't know how. THESE ARE A LIFE SAVER. I have not tried them yet, but they look sturdy, and remind me of the ones we had in the late 50's. These pant stretchers are AWESOME! Better than what I expected. The enclosed hanger makes hanging the pants much easier. I recommend them whole-heartedly. These are just what I have been looking for. Perfect for Jeans great crease, dry faster. less ironing. Mom used these when I was growing up. I live almost full time in an RV. Washer Dryer combo in RV never drys pants completely, Pants stretchers solve this problem and leaves pants looking freshly pressed. I recieved three pair of pants stretchers and just love the way they put the crease in the pants right from the washing machine. I do not have to press jeans anymore and they look wonderful.